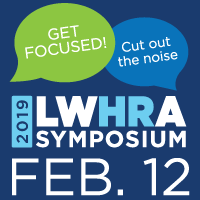 Learn alongside passionate HR professionals - The LWHRA Symposium is the largest all-day event organized by the LWHRA and attracts more than 350 HR professionals. Attending the Symposium gives you the chance to meet and hear from industry leaders, strategists, and leading HR thinkers, like one of our keynote speakers, Rusty Lindquist, who will challenge us in the area of employee engagement. Let HR Professionals meet YOU - The 2019 Symposium program includes breaks throughout the day and an afternoon Reception, providing you with plenty of opportunities to network with potential mentors and experts. Expand your network and connect; you never know who could be a career advisor, mentor, or potential employer. Pick up a new practical HR skill - The symposium program is developed with you in mind. It covers fundamentals, strategy, growth, compliance, pay-equity, career development, and more! You can pick and choose which sessions to attend, giving you the opportunity to delve deeper into areas you are familiar with or discover completely new topics and skills. Probe the latest industry trends and provide your perspective - Symposium attendees have the opportunity to actively participate in discussions on the latest trends. Some of the topics include continuous performance feedback, culture initiatives, developing unique benefits, and the perks to stand out in the job market. Earn SHRM & HRCI continuing credits at a special student discounted rate - We are offering a special discounted registration rate for students. LWHRA understands that emerging professionals like you will become the next generation to enter into the HR workforce and we want to connect with you! So register today and bring your bright ideas on February 12, 2019. Register now to take advantage of this early registration offer. Lock in your rate and pay later by selecting the "invoice me" later option when filling out your registration form. The 2019 Symposium Student Rate is $155. Comments on "5 Awesome Reasons Students Should Attend LWHRA's 2019 Symposium"